Intricately hand-crafted using over 550 parts. From the stainless steel eagle atop the bell, to the tiny bulb detail within each light, this 1:50 scale replica emulates Wheaton's RS742. Our goal with each release is that our customers may notice something new each time they view the model. This Seagrave Marauder II with Rescue 1 body features impeccable detailing and true-to-scale parts that only stainless steel can provide. Fire Replicas has ushered in a new standard in 1:50 scale modeling that is sure to impress the most discriminating collectors. Limited in production for lasting value. Only 200 units of RS742 have been produced. Fire Replicas are designed with the elite collector in mind, and manufactured in limited quantities to enhance long-term value. Preserved and protected in a custom case. 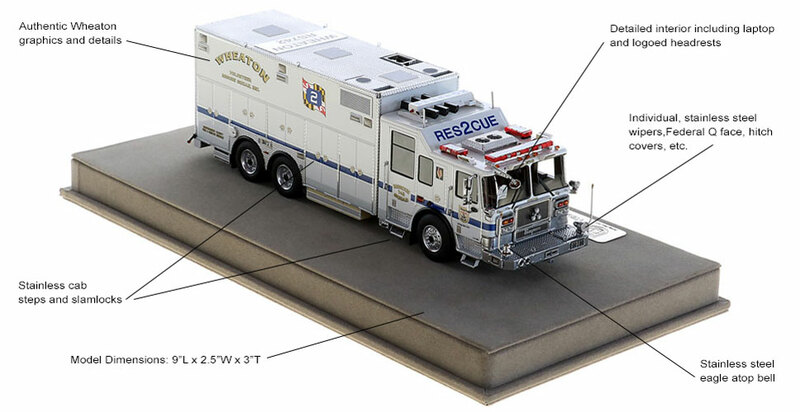 The Wheaton RS742 measures 9"L x 2.5"W x 3"T and is securely displayed inside a custom case. The case dimensions are 12"L x 6"W x 5.25"T and the platform includes an etched stainless steel nameplate with the Wheaton seal, department and truck name. 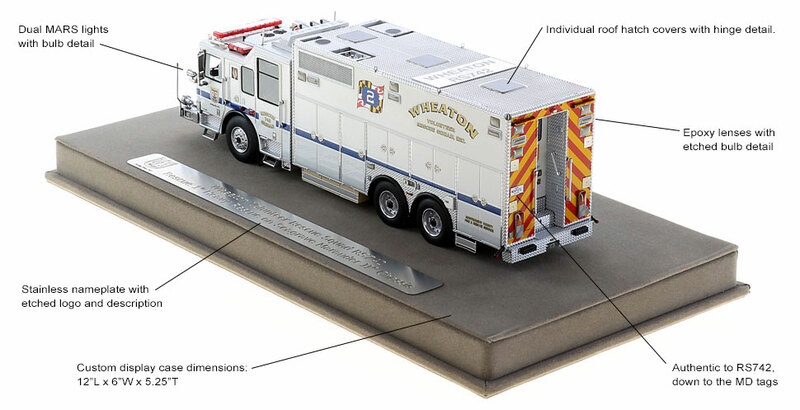 This Wheaton RS742 scale model is a museum grade replica of the Seagrave/Rescue 1 Walk-in Rescue. Like all Fire Replicas models, every detail is modeled to perfection and with razor sharp precision. The replica features the specific department configuration and graphics, leaving no detail overlooked. The display case is custom manufactured with high quality acrylic and resin. The stainless steel etched plate features the department and truck name, and department seal. This replica is a treasure to be displayed and admired and is in no way a toy. Several years ago, I had the opportunity to spend a couple of hours at the Wheaton VRS in Maryland and see the Seagrave shortly after it was delivered. An amazing truck. 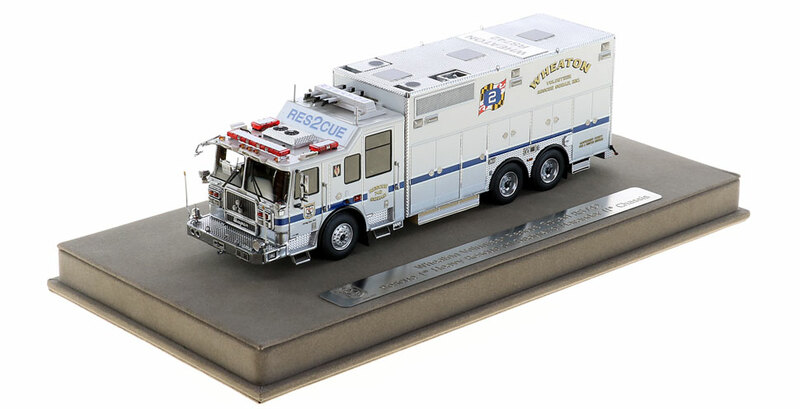 When Fire Replicas announced they would be making the Seagrave/Rescue 1 model, there was no doubt this would be added to my collection. It truly is a miniature version of the original truck. Fire Replicas is to be commended for its attention to detail - down to the smallest item. Love this model and have it on the main shelf in my office displayed. Well done Fire Replicas. Another amazing Fire Replicas. When I got the email on this and shared it with my wife she said "Get it". I was in shock, she really said that. Well I wasted no time and within days I had it. Even she was amazed at the detail and trim. This is my sixth Fire Replicas and a 7th is in the making. My next purchase will be Savage (MD) VFC's ladder truck. It is a fund raiser and gotten only thru Savage Fire Company. Looking forward also to the Boston rigs. I feel like a kid in a candy store. Thanks Fire Replicas...you put out nothing but the best. Thank you from thirsty / hungry collectors. Words are beginning to fail me as far as reviewing Fire Replicas model, this another stunning model with superb detail throughout, nothing has been forgotten & it can be summed up in one word.....WOW. In usual Fire Replicas fashion, this model is fantastic. Detail and paint is superb. These models just keep getting better and better. Fire Replicas have once again proven why their models are called museum grade. The detail and quality of this Squad is second to none. I have purchased several models and each time I receive them I am blown away by craftsmanship. This Squad certainly does not disappoint. What can I say other than outstanding job! As with L26, five stars isn’t enough. I've riden this piece for work as Montgomery County staffs it dayside. I can tell you first-hand this replica is gorgeous and will look just as great in your living room as it does in person. Great job! Fire Replicas continues to raise the bar. I don't know how they do it, but the Wheaton Seagrave Rescue Squad is another improvement over their already insanely super-detailed and accurate models. The big Seagrave Marauder chassis with Rescue 1 body makes a perfect subject. Every detail is captured perfectly; including stainless steel etched steps, beautifully cast bell & siren, spectacular emergency light bars, ultra-accurate "Command" light tower on the roof and flawless cabinet door and slam-lock detail. This does not even get us to the best part! In addition, the Rescue's roof is simply amazing with the level of detail obtained! Throw in accurately scaled etched windshield wipers and the Seagrave logo and Roto-ray on the grill and you have a masterpiece of a model. The best part is the awesome white finish w/blue striping and gold lettering (this color scheme also goes great with the extensive use of stainless and chrome). Fire Replicas (as always) has done a perfect job with the fit, finish & markings. THIS IS THE BEST LOOKING RIG FIRE REPLICAS HAS PRODUCED TO DATE! I could not settle for just one and will be buying three - don't wait until this sells out. Awesome attention to detail. Very unique rig.